The Lady Chapel Singers, so named because they first sang regularly in the Lady Chapel of St. Mark’s Church, Locust St. in Philadelphia, was founded in 1993. This professional vocal ensemble was dedicated to historic and contemporary sacred music by, for, and about women. Lisa Neufeld Thomas was Artistic Director. Robert A. M. Ross was Music Director. The group was sponsored through The Women’s Sacred Music Project. They presented concert and liturgical performances. Their repertoire spanned the eighth century to the present, with newly commissioned works sharing the program with ancient songs by Kassia of Constantinople, and Hildegard of Bingen. Concert programs also emphasized cultural diversity, often including American and European works with music from African, Native American and African American sources. The Lady Chapel Singers, as the performing ensemble of the Women’s Sacred Music Project, were part of the International Honour Committee of the Foundation Adkins Chiti Donne in Musica. Although based in Philadelphia, the Singers sang throughout the US, in England, Italy and Germany. They sang for Eucharists, Choral Evensong, Vespers, and Lessons and Carols. Philadelphia area venues included St. Mark’s, Locust St., the Philadelphia Episcopal Cathedral, St. Peter’s, Pine St., Rosemont College and the Cathedral Church of St. John, Wilmington. 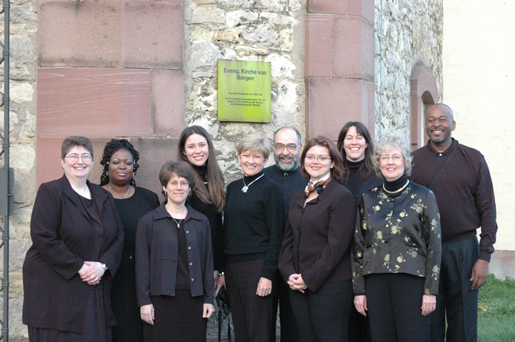 On tour they sang for services at the Royal Foundation of St. Katharine, St. Paul’s, Mile End, London, St. Saviour’s, Devon, Christ the King, Frankfurt, and the Evangelical Church in Düsseldorf. Concert tours included Buckfast Abbey, the Evangelical Church in Bergen-Eckheim, Germany; St. Michaels and All Angels, New York City, St. Columba’s, Washington, the Washington National Cathedral, Grace and Holy Trinity Cathedral, Kansas City, MO; Christ Church, St. Joseph, MO; St. Mark’s, Medford, OR; and St. Paul’s, Salem , OR.